I'm a ranch snob. It's true. I can't stand that stuff they sell at the grocery store... I crave the good stuff. You know, the ones that restaurants use when they serve you a giant plate of cheese fries? That's the one. Only you can't really find it unless you want to buy a giant tub of the stuff, so I've been searching for a recipe to fill my 'ranch needs.' And, I think I've found it… You'll notice there's no dill or parsley - I think that's really part of the secret. Start by combining the mayo, milk & sour cream, whisk together to make it lump free. Then add in the rest of the ingredients. You can eat it immediately, but I think it's much better once it's had time to marry in the fridge - at least an hour. I also like to add a little water to it when serving to make it a little more liquidy. 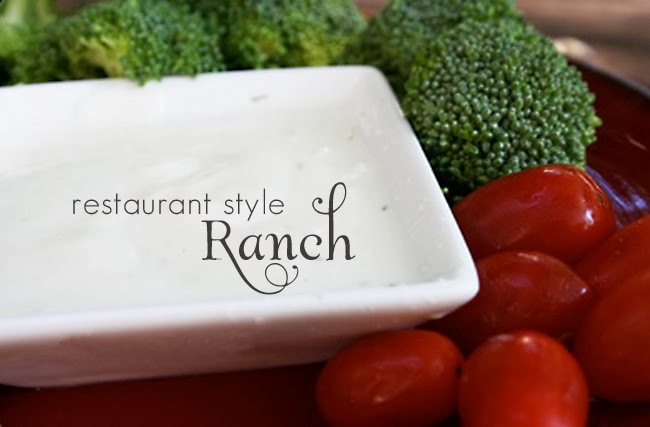 I, too, am I ranch snob! There is nothing worse than the bottled stuff... I like to use the hidden valley seasoning packets. Add a little milk and mayo and voila! It tastes nothing like the hidden valley in a bottle and it is quick and easy!